In brightest day, in blackest night, no evil shall escape the sight of this deluxe action figure of Green Lantern Hal Jordan! Every Green Lantern fan in space sector 2814 should own this amazing figure that comes complete with dynamic power ring constructs including full flight suit that he can wear! INCLUDES WEARABLE CONSTRUCT FLIGHT SUIT 9. 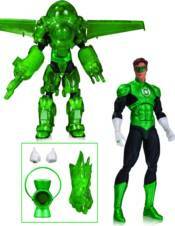 GREEN LANTERN HAL JORDAN: DARK DAYS - 6"